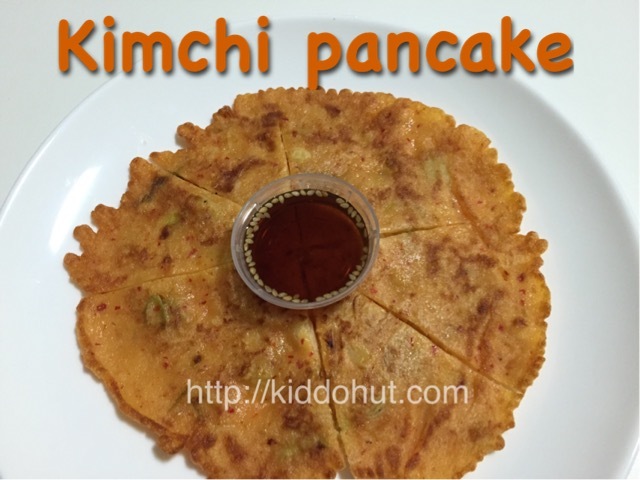 Kimchi pancake is one of my favourite Korean dishes and a must-have whenever I visit a Korean restaurant. 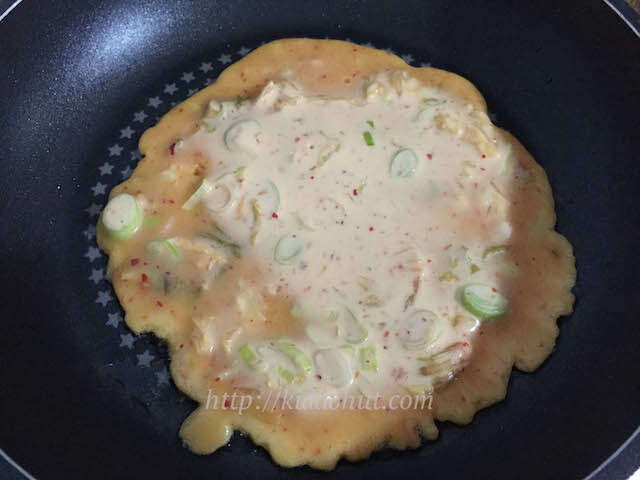 I still can remember the taste of the Kimchi pancake I had during my holidays in Korea. 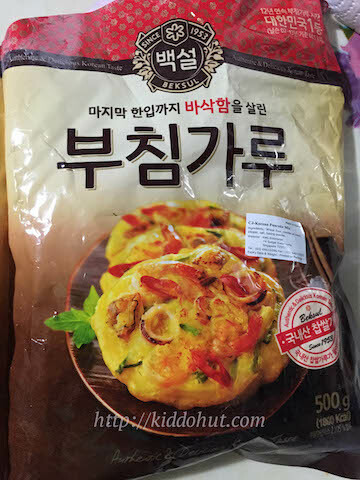 Actually, there is nothing to shout about for this recipe as I have used the premix Korean pancake flour. But, bearing in mind that there is no cooking methods in English on the packaging. I started to guess the amount of water from the Korean words on the packaging, using this blog named My Korean Kitchen as a guide as well as my cooking experiences. Viola! 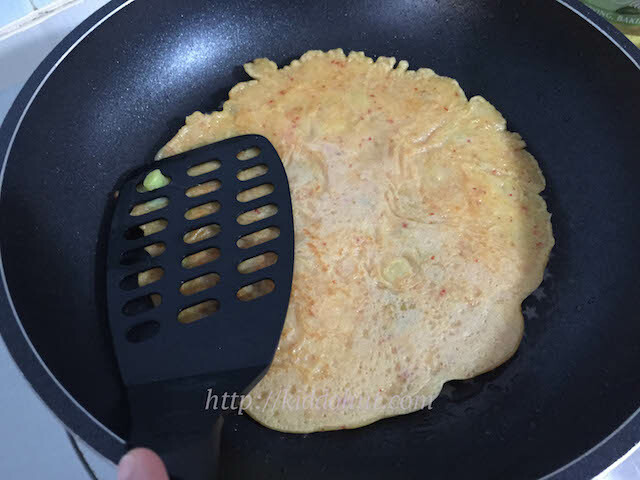 The taste of my Kimchi pancake turned out to be very close to that served in the Korean restaurants. Plus the dipping sauce which I used the dipping sauce recipe exactly from the same blog. The blog didn’t mention the temperature of the water to use. I find that we should be using hot water to dissolve the sugar. The pancake and the dipping sauce are perfect match. Probably I will try doing up my own pancake premix someday. On the packaging, it says wheat flour, onion powder, baking powder, salt and pepper. As simple as that. 1. Pour out the kimchi liquid from kimchi packaging and squeeze out the liquid from the Kimchi. Set aside. 2. Mix the premix with water and 50ml of kimchi liquid. Add 2 eggs and mix well until batter is formed. 3. Add in kimchi and leeks. Set aside in the refrigerator for 30 minutes. 4. Heat up the non-stick pan with olive oil. Ensure the oil is spread out evenly. 5. Scoop out the batter with a ladle and pour into the pan. Use the back of the ladle to spread out the batter. 6. Cook the batter on high-medium heat for 20 seconds and when it is 70% cooked as per picture below, turn it over. Note: depends on the stove and pan you are using, adjust the heat accordingly to prevent burning of the pancake. 7. Press the pancake, especially the sides. 8. When both sides are cooked to desired crispiness, serve with dipping sauce. 1. Dissolve 2 tbsp of sugar in 3 tbsp of hot water. 2. Add the rest of the wet ingredients and mix well. 3. Lastly, add the roasted white sesame.